I recently confessed that I’m in the minority and don’t regularly read books. However, if you’re like most of America (and the world) you probably love cozing up under a blanket and enjoying a good read on a chilly night. The makers of Honeywell recently asked women what their favorite books to read were and the top 10 included the Bible and Fifty Shades of Grey. I never thought I would type the names of those two books in the same sentence! To see the books that rounded out the top 10 click HERE. It will be no surprise to my readers that I haven’t read any of them (although I did see the Hunger Games movie if that counts!). 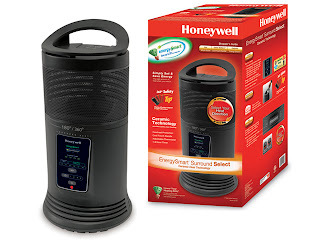 Also, while you’re there you can enter for a chance to win a Honeywell Heater or one of six Amazon gift cards. How cool is that? Click HERE to enter! As if one giveaway wasn’t enough, the gracious folks at Honeywell will also be giving away a Honeywell EnergySmart®360° Surround Heater (retail value $59.99) to one lucky Dollops reader. Want to know more about the heater? Well the new 360 Surround Heater is a versatile, energy efficient ceramic heater. Equipped with an energy savings thermostat that gives you just the right amount of heat by regulating the wattage consumption based on your desired temperature, the EnergySmart® 360 Surround can save consumers money without sacrificing comfort.